Base 21 is one of the strongest layouts by default because it has access to three traps and three "environmental" traps: two wooden platforms and a dead end. It is because of these environmental traps that many designs for Base 21 revolve around precision jumps—one false move and you fall to a dead end and are forced to restart. The most unique defense I have seen for this layout is the door on the left, chest on the right, but with staggered wooden platforms in the connecting hall that force a trick jump (catching the second platform from underneath via the corner of the wall to allow for a jump off of the second platform and into the chest). I have, though, seen this defense and its variations a lot—this makes the layout to be a unique design but also not very uncommon anymore. The following is my Base 21 design that is very unique, fresh, and can be quite difficult. I won't go so far as to say it is the "best" defense possible for the base, but I will say that it is certainly the most difficult I have ever had to save here—and I have saved every single Base 21 layout I have ever seen. I guess you could say I am infatuated with Base 21. Anyway, here is my design. I will give cookies to anyone who records a video of them saving it, because I really don't want to spend hours again trying to record it—it might take days before I can get a video of it in the thread, but maybe one of you pros could record one more quickly. I had a lot of fun designing this, and really tried to make it as unique as I possibly could. I would love to find a more effective placement for the spinner, but it does serve a very special purpose in its current location. It can be three-starred more easily with potions, but, so can all bases, and they will not help as much as they do on other designs for this layout; Even with potions I have yet to be three-starred, and it would be truly rare to even get a one-star clear. Edited by Darkon, 27 July 2018 - 01:15 PM. You are my new favorite user, you actually put thought into your posts and work. I have a great bad habit of always removing traps from my design, one at a time, to see how effective the layout it is once a trap is disabled with a potion, and then by death—unfortunately I also tend to accidentally overwrite my designs with similar ones that have traps moved all over the base so that I can test. I gave up and changed back to the default 35,000 trap setup I had saved, raided a little, then got the "ermagerd, stahp playing and go outside" pop-up...so it doesn't look like I will be able to set it again tonight. I mean...I guess having to save it again will mean at least I will be able to get the video accompaniment for proof-of-concept and to prove it has a solution (although the experienced players can probably already tell that it can be solved and just requires a ton of hopping up the right wall, timing, and crossing to the left occasionally). What I tried to do in my design was utilize the environmental traps as best as I could. 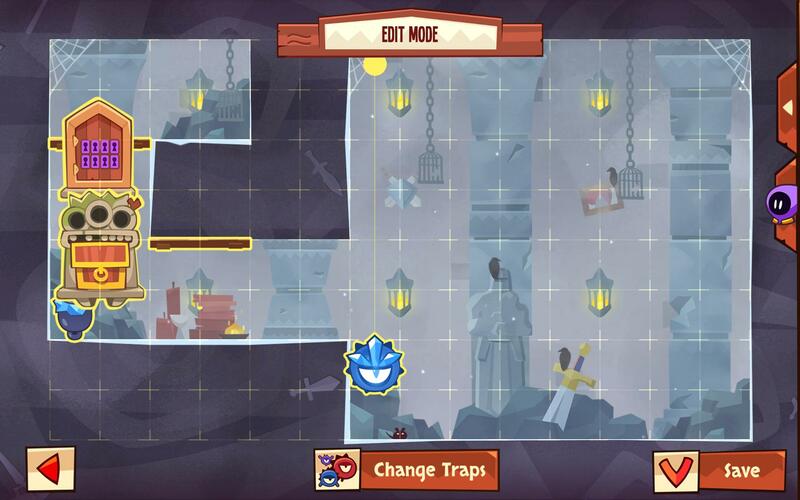 The top wooden platform creates a dead end—jump too high, and you are forced to restart. The lower wooden platform enables the design to function—hopping up the right wall to stall is now possible and required, and missing the timing will result in death (too early or too late and you miss the ledge and go left, and if you fail to jump in time you slide off the wall into the dead end at the right). The cannon placement forces a pixel-perfect jump at the very bottom of the platform so that you have (just barely) enough clearance above your head to avoid a bullet as you cross to the left, and allow for a slide to the chest—but getting to that exact moment when the timing is right between the bullet and the edge for that perfect jump requires a lot of stalling. Enter the spinner—snags a few early kills (hopefully) to force it disabled via deaths or to be the target of the disable potion, and it also forces you to cross over to the left. If you stall 5 jumps worth on the right, the spinner will hit your face, so the first jumps are pretty much set in stone: Edge jump to stay right, edge jump to stay right, slide (to avoid the top dead end) then jump left, slide (to avoid the top dead end) then jump right, edge jump to stay right and miss the spinner by a pixel or two. The edge of the platform actually has a few pixels that give you the ability to jump and stay right, so making at least one of the jumps on the bottom most pixel is (as far as I can tell) mandatory to allow for the proper delay so you are able to clear the spinner. Basically the design is annoying af and completely restricts player movement, and punishes mistakes with a heavy hand. Here is a shooped version of the layout to help clarify (to anyone who would like to bother setting this as their layout before we get a video in the thread). The green lines represent the little bit of choice you have between pixels in your edge jumps, the green circle at the bottom is pretty much ground zero and the absolute spot the player must be at when the stars align so that the jump (blue line) puts you completely under the top platform and the bullet, and that small, uncolored 2x2 grid with a little bit of clearance above and below—that area is all that is left to the player to work with; everything that is red is a dead end or otherwise inaccessible. Just tested this one. Really nice design. It requires the double cannon, which is the orb set, or it's far more susceptible to potions. But still I think your gems would be very safe here. Great work! The design is the platforms and the door; the traps can be moved as anyone sees fit. But I did some more testing, and I am not sure I am as entirely satisfied as I was before. It turns out all the trap placements I have tried can still be disabled pretty effectively if the player knows what to expect (which sharing the design is likely to increase exposure and decrease the number of surprise deaths). I didn't run into this problem with my attackers, but after really getting the hang of all the variants I have been trying, I have noticed that the design will get weaker as time progresses. In the original design, the spinner is very important—if the spinner is disabled, then the cannon placement means the base can be cleared by hugging the right wall 6 times in a row before crossing at the bottom. If the player misses the timing and hugs again, then they can cross a bit more easily on the 9th jump. If they are really into the rhythm then they could technically hug the right wall all day until they find their comfortable cross. Alternatively, the player can avoid the spinner, suicide 7x into the cannon, then disable the other cannon, and slide to the chest without contest for a 3-star if they have a lucky streak on their heartbeats. If the cannons are moved down one block then hugging the right is much less effective because it takes longer to get the timing (increasing the likelihood that a mistake will be made), but it also allows for different pacing on you cross overs—notably, if you use the spinner placement from the above posts, but move the cannons down a block, then the layout is solved fairly easily with a: jump to stay right, cross to the left, cross to the right, jump to stay right, jump to stay right, then cross at the bottom of the platform to slide to the chest. Moving the spinner to interfere with that simple solve just means the player can disable the spinner, and then perform the same steps to clear. The good part is it can take a while to get the hang of the layout, and there is plenty of room for error even if you know what you are doing...but most of the difficulty relies on having three traps which results in some variants being harder to save than they are to raid. The trap placement in the original layout is still by far the most difficult to save I have encountered, but what I called "pixel-perfect" appears to only have referred to my original save—however, if you are able to find a way to stall for longer, or more heavily favor certain pixels on the platform jumps consistently, then there may not actually be a pixel-perfect jump required. Rather, a lot of the jumps can be very timing specific, but not exactly requiring an incredible amount of precision. Another slightly disappointing feature of the design is that there is not a lot you can really do with it. You cannot stagger your cannons above each other because you will not have time to cross under the bottom bullet and arrive at the chest before the top bullet is slamming into you. 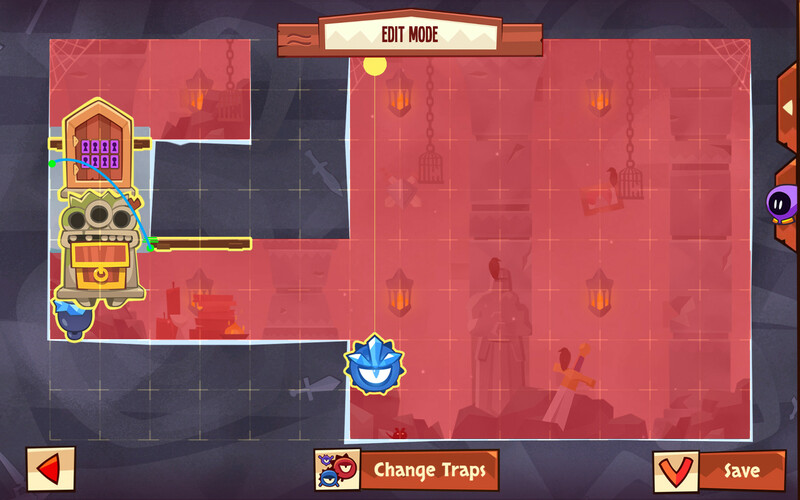 If you move the cannons to any location other than the left-most column then you leave a clean path to your chest. And, as always, the spinner can just be disabled no matter where you decide to put it. Anyway, I did mention in the original post that I wouldn't ever claim it to be the "best" defense, but it certainly is different, and I have set 4-5 variants of this design fairly easily, but the original one is still probably the most difficult to save, and I was unable to do that one today. I settled for moving the cannons down one block since it was easier to save, but I may move the spinner a little to the left and just spam jump 20+ edge jumps in a row so that anyone using a ghost potion won't be able to guess that it could have been much simpler if they just crossed twice after their first platform jump. The original cannon placement, though, at least forces the player to make at least 6 jumps in a row on the platform to earn their first shot at crossing over...so at least it still has that going for it! I shouldn't be bummed that a design can be more easily beat with potions (it's what they're supposed to do after all lol), because even some of the best designers out there still have bases that can be instantly 3-starred with a disable and gang. Edited by Darkon, 15 February 2017 - 12:33 AM. Don't get yourself down. Doing that ledge jump 6x in a row is not easy. I'd say the orginal design is "potion proof" or as close to potion proof as you can expect from any dungeon. With the double cannon, you still have to sneak under a cannon shot after multiple jumps from the ledge, which is very difficult. The only thing I have not tested is using the last thief in a gang to stall the first jump from the ledge, as that would alter the timing of the whole solution and may enable getting to the chest with fewer ledge hops. Only way to test that would be to find the base in the wild. I am kind of curious too now about a gang with the last thief making the edge jump.. or, if the last thief can just cross over from the very bottom of the platform and make it under the bullet on the very first jump. I hadn't thought of that, but I also haven't had the chance to see it yet. I have the original currently saved again at my base so I will keep my eyes peeled. I spared myself a huge headache by spotting an earlier valid cross and shaving off several jumps and back and forth attempts, but now I can say since finding that solution that it isn't the hardest base I've ever had to save anymore lol I went from 20+ jumps to just 10 timing jumps, 2 standard jumps, and 2 pixel specific jumps—yes please. Still hard, but no longer impossibly difficult to save. Which can be good I guess—it will increase the likelihood I get to raid it some day lol Now that it is set I will attempt to upload a video since I can afford the fps drops. That gang potion really has me sweating now though because the ones I have seen were not used well—if a single gang could kill the design just by immediately jumping after the spinner is gone I would be a sad panda, and I would be equally if a well-timed last thief can fix the timing to clear it sooner than 6 total jumps. Edited by Darkon, 16 February 2017 - 03:35 AM. My bad—10 timing jumps, 2 standard jumps. Got the total count off, and still not entirely sure any of the jumps require pixel precision, although they do get pretty close in my book. Confirmed—last (2) thieves on a gang can immediately cross under the bullet after the spinner has been disabled. Given the proximity of the traps, and how close the chest is to the door, it does not surprise me that DT is used by roughly half of all the visitors to the base. Nearly one third of all visitors used a gang potion, and almost every gang was accompanied with a slow—but that is also not too surprising as most players stack those potions together often. Nobody uses ghosts really unless the player gets to a safe spot easily, but since the design forces immediate action (or be thrown into a dead end), it isn't too shocking that so few opted to use one—this means until the design becomes more known, it will be harder for people to know what to do. The gang concept Fezzik pointed out does mean though that it can be 3-starred with potions easily (at least if the attacker knows what to expect)—disable the spinner, gang then slide and cross. If the cannons are moved down a space then that same jump will not clear the chest in time, but if the cannons are lower then it means it is also subject to a simpler solution. Edited by Darkon, 17 February 2017 - 12:20 AM. It is also important to note that the replay for the last gang thief is actually kind of specific—it isn't really the last thief, but rather the thief before the last. The last thief would actually die before reaching the chest as the second thief only reaches the chest at a pixel-perfect moment with a bullet covering half his face. So... I do not know if that information makes it easier or more difficult to use a gang effectively. I also don't know if disabling the spinner is required since the first thieves would fall to their death anyway, and the spinner will just eat them instead while passing by. I'll post again if I see another replay that follows a similar strategic shortcut! Edited by Darkon, 17 February 2017 - 12:29 AM. Awesome base, unfortunately Gang of thieves usually ruins the most creative bases, it's a very solid base but the gang + disable trap stratagy was the first thing I though of when I saw your layout, and I haven't played this game in months, though it would still take perfect timing and a slow motion pot. This base will still work great because most will not understand wich trap to avoid and which one to disable, and it's so different than the normal "good" bases that everyone has memorized. Maybe you could adjust the spinner to kill the last few thieves of the GoT potion, find a delayed route with the same sweep, I can't help with testing because I've only had this layout once and that was a year ago, keep up the good work and you will have some unique perfect bases. When they add an update with new traps I'm sure you will have more bases to show us, just keep the gang of thieves potion in mind with anything you build. Sometimes it's easy to ensure that all thieves from the potion will die, and other times it's impossible to not have one escape. Edited by Smooglew, 17 February 2017 - 11:17 PM. Such a shame that gang can pass it easily, but don't beat yourself up over that. It's very rare for a base to have no weaknesses. I doubt very many people will identify the vulnerability. There are pros and cons to having a doubled trap like that cannon in your layout. Yes, it makes the cannon less vulnerable to being disabled, but it makes the entire base more susceptible to DT+gang. You may be able to use a single cannon instead of a doubled one if you can protect it from being disabled with the other 2 traps. And if carefully designed, the other 2 traps can also be independently anti-gang, so that no matter what a raider does, he can't use gang to pass the cannon. Perhaps give the SPN/HOM/CAN set a shot and create an anti-gang tight spawn trap with the homing cannon and spinner. Keep the original cannon, totem, door, and platforms. Maybe it's not possible, but it's worth exploring. Yeah, tried the homing cannon, but unfortunately there is no placement for it without an unavoidable hit or it being completely useless. The chest, door, and platforms are all pretty stuck—if you move the door then you can't use the core of the design which is forcing them to stay on that wall under the dead end. If the top platform is moved then you lose the dead end, but it could probably be moved in the center of the top to prevent a ceiling jump straight into the chest—at least you would still force them to a wall. I may try that. The only reason the homing cannon can't be used is because of that dead end—without it, I would probably be able to avoid being killed just by jumping up the path. Could probably open up moving the door up a block too since the platform wouldn't be there. But yeah, in the current setup, the homing cannon cannot go in the left column because when you fall from the door the cannon shoots up and right, placing the bullet into your edge jump. If you move the homing cannon in the right column then it does not protect the chest, but it also shoots straight up at you which also means you hit it on the way down from your edge jump. Removing the dead end up top may very well let me finally use the homing cannon. And just maybe, depending on where a jump places me on the left wall, maybe I can move the chest down a block—currently if you move the chest though it will not be able to be reached before a bullet hits you since you just have one long solid slide. Edited by Darkon, 18 February 2017 - 04:57 AM. Cannon can stay in the same spot or move down, but the chest has to stay in its current location due to slide duration. I can try a homing cannon now too, and a completely different spinner placement since it doesn't need to force an early cross. That first jump though, with the platform in the way, is brutal, and forces a very very specific timing on multiple jumps in a row just to barely make it to the right wall for edge jumps. I love it. Not as fun to see as a gimmicky dead end at the top, but probably even more brutal now. And I would say it's probably gang proof with that setup since you have such a small gap to fall through in order to have enough time to slide and make a cross to the right without over shooting it and arriving right back at the door. No lol When I joined the forums, I didn't bother to read every single post, much less those from well over a year before I played lol The platform wall jump was inspired by my interaction with running into (what I believe is) base 33 (although I haven't played in a year and looks like kotdb is down now, so I can't be sure). But it had a popular layout at the time I started playing KoT that involved that platform jump from the wall, and if you missed it then you'd slide into the corner and hit a saw. I learned that a platform can be placed at the bottom of the wall, and to consider platforms as potential traps. There are not many dungeons where we get platforms, and my thinking was to utilize the platforms as traps instead of just ways jump farther or higher. The platform at the top trapped them in a dead spot which was very simple to come up with when I decided that my entire defense should be in the left, making the right side dead end a giant trap itself. The platform at the bottom forced specific jumps. That was my thinking lol So it's definitely good to see that some people have also came to the same conclusions, and well before I played at that. But the logic is too straightforward, you can literally come up with the top platform placement in a few minutes when you're putting platforms only in the left side—you can go up through them, but not down through them, so you can become trapped even by mistake when planning. Since the top is the easiest place to block off with a platform, and you can't have the door above the platform.. yeah, the door placement and top platform designs itself really lol Then you're stuck falling down a corridor where you can't go up, so you have to slide on the right. You only have a couple places where traps can go, so even the traps start falling into a logical placement based upon where you put the door and platforms lol There is only one good placement for the cannon, and that's on the left wall (since it always fires straight, and you WANT to utilize the lower platform to force multiple jumps lol), so the cannon can't be on the right. You could have it shoot down on the left but it's not very effective, so the logical choice is facing up since you want the player to travel into danger (not away from it). Edited by Darkon, 27 July 2018 - 01:10 PM.